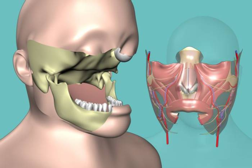 One of the RCCC’s most promising short-term therapies for patients with the most severe craniofacial injuries is the ability to transplant facial skin and underlying bone and muscle. This type of procedure received considerable media attention with the first partial face transplant in France in February 2006, and the first face transplant in the US in December 2008. Key to the long-term success of the procedure is a new method to induce “immune tolerance” in the transplant recipient so that the transplanted facial tissue is not rejected. Earlier transplant procedures, both with partial face and with limb and other “composite” tissues required massive immunosuppression, with its related side effects. The new method should reduce or even eliminate the need for long-term aggressive treatment with drugs that suppress the immune system. This revolutionary procedure has been tested in preclinical studies with results extending out 2-3 years. The individual components of this therapy have been tested for safety in humans, and AFIRM will explore the safety and efficacy of the complete procedure in humans. If these studies are successful, severely injured patients needing transplant of face and limb tissues may have a chance to enroll in clinical trials in the near future. This project aims to develop tissue engineered cartilage constructs for ear replacement. Total external ear reconstruction is one of the most challenging problems in the field of plastic and reconstructive surgery. The current standard therapy to reconstruct the outer ear involves carving cartilage taken from a rib, which can result in a poor esthetic outcome. 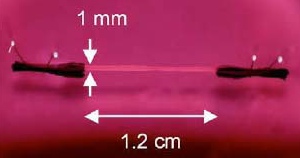 Alternatively, synthetic material frameworks can be implanted which simulate the contours of the ear. However, these implants are inflexible and predisposed to complications including infection and extrusion. In this project, replacement ear cartilage will be engineered in composite scaffolds fabricated from synthetic and natural materials and seeded with a patient’s own cells. A variety of FDA-approved materials are being evaluated with human cells in an immunodeficient rodent model and with autologous cells in an ovine model. Scaffold materials will be assessed based on the ability to support cartilage formation with minimal shape distortion. The project team aims to test the top performing scaffold material in a clinical trial. Strategies are being developed for facial muscle replacement, with the first target muscle being the orbicularis oculi (eyelid) muscle. Physiologic immature muscle which approximates the size of a fascicle of an orbicularis oculi muscle has been engineered and characterized. A blood vessel network is being engineered in vitro within the immature muscle. Upon implantation, this vascular network will connect with the host vasculature, and the muscle will be innervated by the host nerve. Finally, scaffold approaches are being developed to scale this immature muscle to the size equivalent of a human orbicularis oculi.